Here's an example of your WBMLP Electric Bill. Click it to enlarge. Here are answers to common Electric Bill questions. 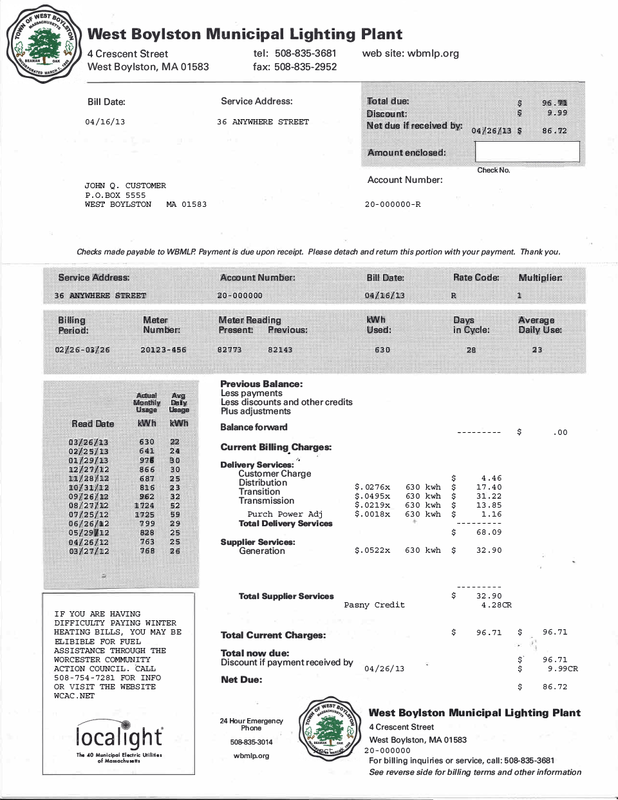 See the sample bill on this page. Definitions to bill categories are just below. Got a question? Please give us a call during regular business hours at 508-835-3681. By Mail using the enclosed envelope that comes with your bill. Pay Online. Click here to pay safely and securely with UniPay Gold. By stopping by our office with Cash or a Check. By Automatic Payment. Click here for an Automatic Payment Application Form. "Discount" and "Net due if received by" This is the total amount due for the month, minus the early payment discount, if applicable. "Rate Code" This is your type of account. R = Residential Rate. "Meter Reading Present" This is our most recent meter reading. You can read the meter yourself by looking at the digit display on the meter. "kWh Used" This is how many kWh's (the amount of electricity that you consumed) during the month. "Actual Monthly Usage" This area allows you to see your monthly energy consumption history over the past 12 months. "Avg Daily Usage" This is the kWh's per day that you consume. Look for trends and determine what appliances in your home that may be contributing to higher consumption. "Customer Charge" This is the amount WBMLP charges to cover our fixed expenses, no matter how many kWh's you consume. "Distribution Charge" This is the amount WBMLP charges to cover our fixed expenses, no matter how many kWh's you consume. "Purchased Power Adjustment" The Purchased Power Adjustment helps us adjust the bills up or down to account for fluctuating market power and transmission costs. "PASNY Credit" A discount on all residential bills as a result of WBMLP purchasing very inexpensive hydroelectricity energy from the Niagara and St. Lawrence River. "Discount if Payment Received by:" WBMLP Customers receive a 10% discount if they pay their monthly bill within 10 days.